The Problem: installing traditional light box annunciators in classified hazardous areas requires the use of explosion-proof enclosures or pressurization – with limited access. The Solution: the intrinsically safe LN1000 functions in the same manner and with the same operational logic as conventional annunciator panels, but without the handicaps. In it’s simplest form the system consists of a 24 VDC power supply, an intrinsic safety isolating interface, and a 12 or 32 channel annunciator unit. Additional I.S. interfaces can be used to transfer signals within, or in and out of, the hazardous location. Bright LEDs indicate alarm trips, and LCD displays show the status. Optional audible and visual warning devices can be added for optimum operator attention. Built around a lightweight stainless steel chassis, the LN1000 features dual-channel alarm cards accessible via a removable facia panel. Cards can easily be removed for configuration, or additional cards inserted into spare slots. The facia panel includes custom engraved legend plates for each alarm “window”, plus operator pushbuttons for silence, acknowledge, reset, and test. The basic annunciator unit can be installed in your own panel, or we can supply it installed in one of two different syles of wall-mounting enclosure. Each channel of the annunciator can be programmed independently to respond in a pre-determined manner to the inputs from the alarm contacts on the plant and the operator’s pushbuttons. A range of ISA alarm sequences are supported and selected by DIL switches. Alarm contacts may be normally open, or normally closed. After an alarm has been acknowledged, the LN1000 may return to normal automatically as soon as the contact does so, or it may require to be reset manually. A 3-30 second time delay may be added to eliminate false triggerring of alarms. Each alarm may be added to one of seven first-up groups, or remain independent. The unit may be programmed for three different first-up sequences or ringback sequence. Ringback indicates to an operator when an alarm contact has returned to the normal (non-alarm) state. The audible can be set to resound after a programmable time delay. Group outputs and alarm outputs can be configured to follow the alarm logic, follow the audible, or follow the alarm contacts. All outputs can be set to drive high or low. Alarm Inputs: User selectable as normally open or normally closed. 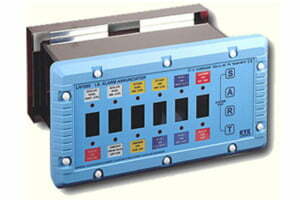 LN1000/12 can have up to 12 inputs which must be isolated. LN1000/32 can have up to 32 inputs which must be isolated. Inhibit Inputs: Each alarm channel can be individually inhibited to prevent alarms being activated. Pushbutton Inputs: Four membrane pushbuttons are fitted to the front facia as standard. Terminals are provided for remote pushbuttons to be wired into the LN1000. Pushbutton functions are Test, Acknowledge, Reset, Silence. Each dual-channel alarm card has two group outputs per alarm channel. These may be configured to follow the alarm logic, follow the input, or follow the horn. These outputs are ideal to drive DA-149 I.S. relays which in turn can be used to control external devices in either the hazardous or non-hazardous location. Horn: To drive the DA-125 horn powered by the annunciator. External Sound: Used to switch a DA-149 I.S. relay to control external sounders. Groups: Two group outputs to drive DA-149 I.S. relays. One is configurable to follow the alarm logic or alarm contacts, and the other functions as a reflash ouput which gives a 1 second pulse on the occurrence of each new alarm. 18-35VDC at 100mA into a suitably certified isolated I.S. interface located in the non-hazardous location. Exloc can provide this. Note: the above figures are for the chassis complete with sequence card – add 4.25 oz. (120 g) for each alarm card installed.